This bacon is a wonderful alternative to traditional pork and beef versions. Don't expect it to taste like pork or beef but it does have the familiar smoky taste. "The only difference between pigs and dogs, is the way we treat them." 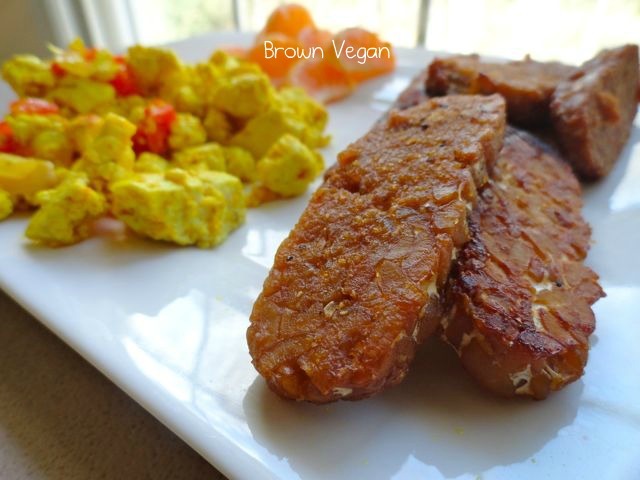 Cut tempeh into thin slices and steam or boil for about 10 minutes in ½ cup of water. Transfer to a bowl and add all remaining ingredients. Allow tempeh to marinate for a few hours (I did it overnight). Preheat oven at 380º and spread tempeh out on foil. Add leftover marinate on top and bake for 10 minutes. Remove from oven, flip over, and allow to bake for 10 additional minutes.